Saturday, September 15th was the first Asian Folk Hour of the Utica Music and Arts Festival sponsored by Starting Over, Mohawk Valley Resource Center for Refugees, SUNYIT and UNSPOKEN Human Rights Festival. It was the first event of Starting Over and our goal was to introduce the project, and ultimately, to bring the people of Utica and the local refugee community closer together. Asian Folk Hour featured two prominent Utica refugee groups, the Burmese and Bhutanese Nepali. First up were the Bhutanese Nepali and we started with a young girl danced to a modern Nepali love song. Then we had a group of Bhutanese Nepali musician and singers on stage. The Bhutanese Nepali women quickly joined them for some traditional dancing! The Karen Burmese took the stage next, coordinated by our friend Daniel of the Mohawk Valley Resource Center for Refugees. There were two dancers and a musician who entertained the crowd with Burmese culture. The Asian Folk Hour went by too quick, and soon we had to wrap things up. Our performers had a great time showcasing their talents and many Utica residents came up to us to say how appreciative they were of the chance to experience the culture! Thanks so much to everyone who volunteered and coordinated this event. Save the Dates! This year, World Refugee Day 2012 is being celebrated by the Mohawk Valley Resource Center with a series of events in June. Members from Starting Over will definitely be celebrating world refugee day, talking with the community and getting photo and video footage for our gallery project. We hope to see you there! For more info, visit the Mohawk Valley Resource Center for Refugees here. In October of 2006, the New York Times wrote an article called Where Young Refugees Find a Place to Fit In. 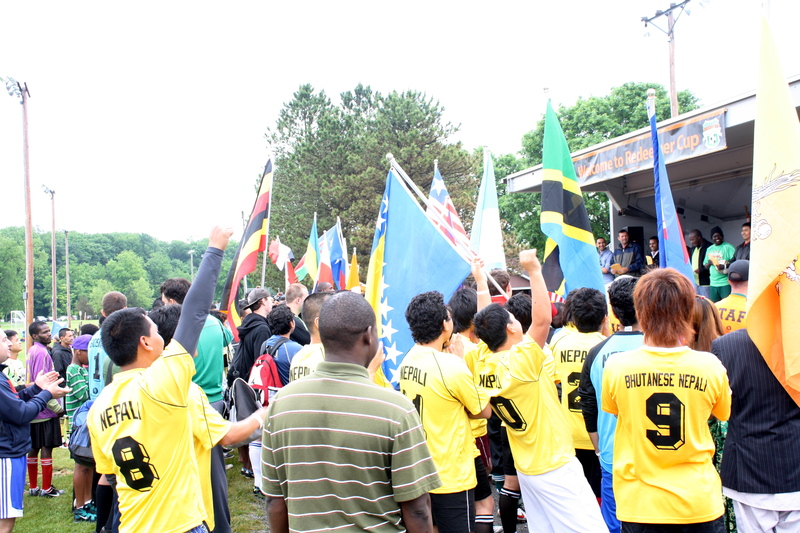 The article talks about soccer in Utica as a resource that brings new refugees together. Many of the young refugees say they owe their survival here to soccer, a respite from trying, chaotic and often lonely lives (Santos, 2006). Today, soccer is still a major part of refugee lives. I recently ran into a friend who came from Burma three years ago with her two sons. She said both her boys play soccer – she has to drive all over with them to games. The Redeemer Church recognized this fact and in 2010 started the Redeemer Cup. The Redeemer Cup is a full on soccer tournament World Cup-style. It is designed so that each team represents a different cultural portion of our community. It is becoming an annual event in the Utica, NY area and is a great way to support the community and encourage cultural unity. Redeemer Church Rick Andrew organizes the event. Andrew said those interested must be between the ages of 15 and 50 to play. One leader of a team must organize a group to compete. There’s usually about 16 teams representing different refugee groups in the area. The 2012 tournament will take place June 2nd and 3rd at Proctor Park in Utica. Starting Over will be there to document the event – be sure to look for the Redeemer Cup display at our Gallery event in December!